A fox saw the mouse and mouse looked good. "Where are you going to, little brown mouse? Come and have lunch in my underground house." I'm going to have lunch with a gruffalo." "A gruffalo? What's a gruffalo?" "A gruffalo! Why, didn't you know? And terrible teeth in his terrible jaws." "Where are you meeting him?" "Here, by these rocks . . .
And his favorite food is roasted fox." "Roasted fox! Oh, my!" Fox said. "Good-bye, little mouse," and away he sped. 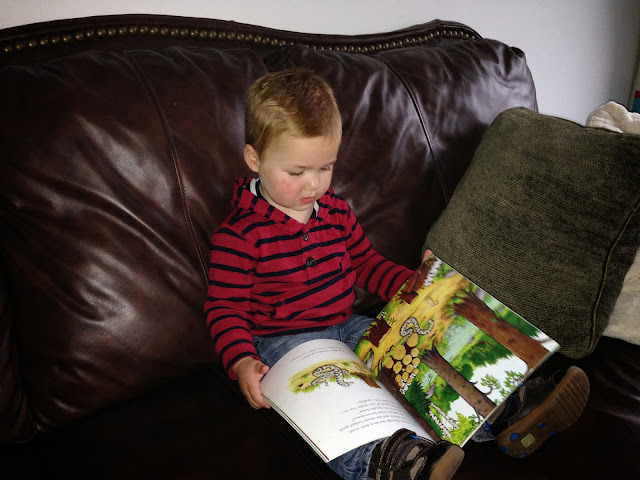 * The Gruffalo, by Julia Donaldson, illustrated by Axel Scheffler. The Gruffalo tells the tale of a mouse walking in the woods who encounters several animals — a fox, an owl, and a snake — who each invite him into their homes for a meal, so they can eat him. The shrewd mouse invents a fearsome creature, the Gruffalo, with whom he claims he will be dining. He describes the Gruffalo's monstrous features and tells each animal that fox/owl/snake is the Gruffalo's favorite food. The animals run away and the mouse mocks them, saying: "Doesn't he know / There's no such thing as a gruffalo!" But then, as he walks in the woods, the mouse comes across a fearsome creature with monstrous features -- the Gruffalo! When the Gruffalo says he wants to eat the mouse, the mouse cannily tells the Gruffalo that he, the mouse, is the most feared creature in the woods, and suggests the Gruffalo follow behind him to observe his fearsomeness. The Gruffalo bemusedly agrees. As they encounter the snake, owl, and fox, each of the animals flees in terror. The Gruffalo, not realizing it's his own presence that frightens the animals, grows impressed with how scary the mouse must be. Ultimately, the mouse threatens to eat the Gruffalo, who runs away. Published in 1999 and having sold more than 10.5 million copies worldwide, The Gruffalo has repeatedly been picked as the favorite children's book in the United Kingdom. It came in ahead of second-place Winnie the Pooh in one poll. In another, it received 18% of the vote for favorite, ahead of The Very Hungry Caterpillar and Peppa Pig tied for second at 11%. 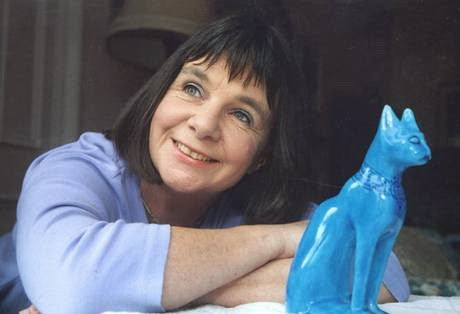 The author of The Gruffalo, Julia Donaldson MBE, lives in Bearsden, a suburb within the conurbation of Glasgow. Although English by birth, Donaldson moved with her husband and children to Glasgow in 1989 when her husband was appointed as a lecturer at the University of Glasgow. Donaldson has remained in Glasgow ever since. She makes occasional (and sometimes surprise or impromptu) appearances in Glasgow and the whole of the U.K. for story readings. One of the mothers of Jackson's buddies has proudly told me of getting to see Donaldson at such an event. I'm on the lookout to find one in the future. Donaldson says she derived the story of The Gruffalo from a Chinese folk story about a girl who encountered a tiger in the woods who threatens to eat her. Donaldson realized, though, that it's hard to rhyme with "tiger." So where did "gruffalo" come from? She says she needed a word to rhyme with "Doesn't he know / There's no such thing as a _____". The Gruffalo was one of Donaldson's earliest published children's books, and it jumpstarted her career. She now has written more than 180 works, of which 64 are published and available in bookshops, while the rest were written specifically for school instruction. The Gruffalo has been adapted into a stage play shown in London's West End, and a 30-minute animated film version — with voices by Helena Bonham Carter, John Hurt, and Tom Wilkinson, among others — was nominated for an Oscar for Best Short Film (Animated) in 2011. Donaldson was appointed the U.K.'s Children's Laureate (akin to the poet laureate) for 2011-2013. 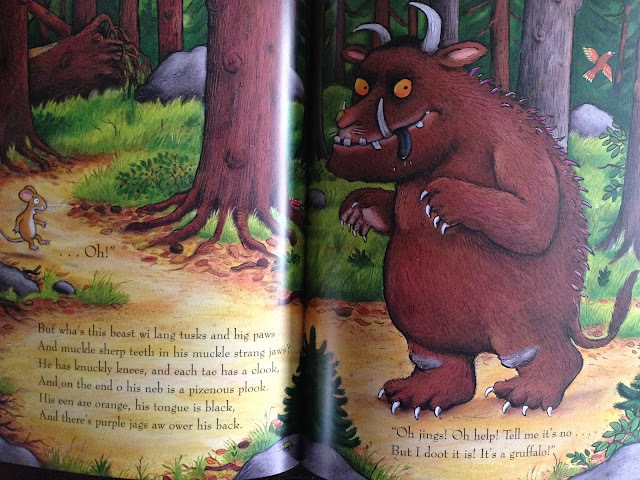 As a sort of in-joke, a Gruffalo makes appearances in the illustrations of all the books Donaldson has written with illustrator Alex Scheffler. In The Snail and the Whale, the Gruffalo appears as a picture drawn in the dirt by a boy. 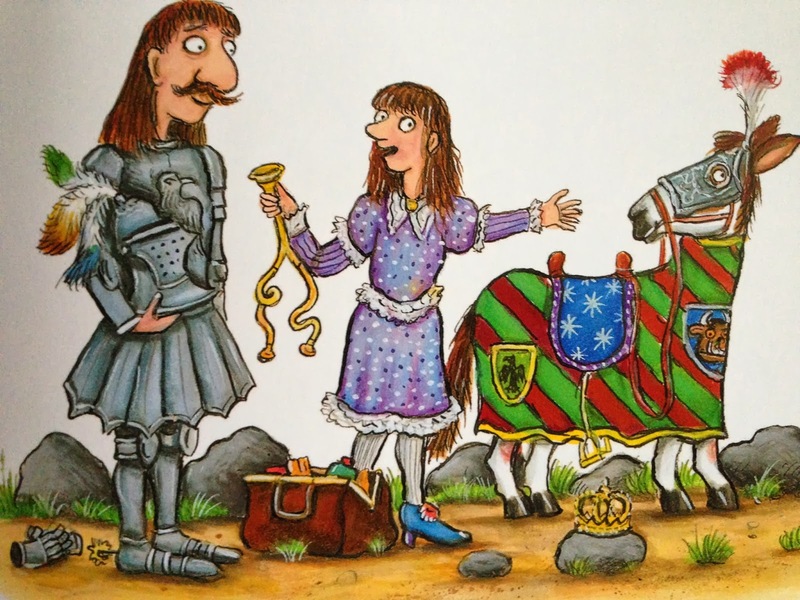 In Zog, the Gruffalo is shown as a knight's heraldic picture on his horse's caparison. In other books the Gruffalo appears as a Christmas ornament, a toy, and so on. Gruffalo appears on the horse's caparison in Zog. Glasgow also makes its way into her books. For example, one of the boats in The Snail and the Whale is named the "Pride of Glasgow," while another is named "St. Mungo" after the patron saint of the city. 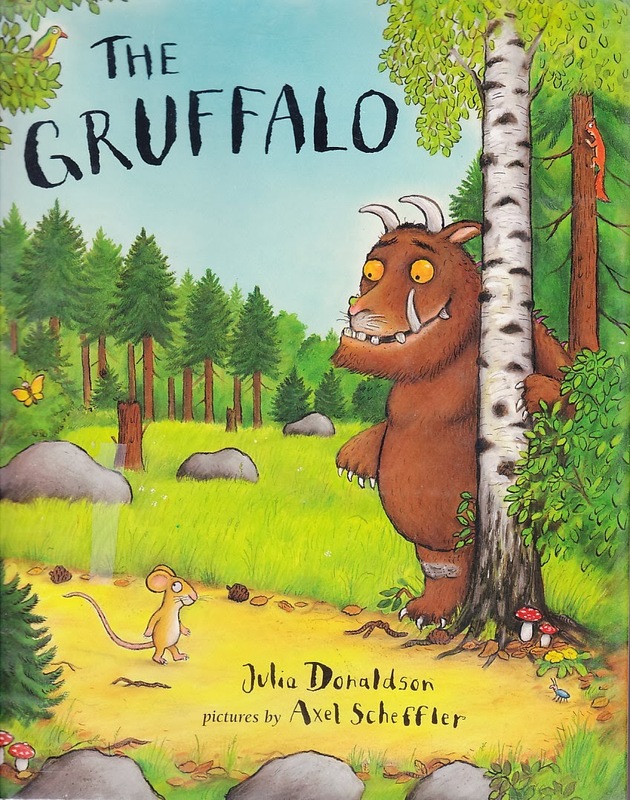 The Gruffalo is one of our favorites, and we're in the process of adding some more Donaldson books to our collection. A moose took a dauner through the deep, mirk widd. A tod saw the moose and the moose looked guid. "Whar are ye aff tae, wee broon moose? Will ye no hae yer denner in ma deep-doon hoose?" I'm gonnae hae ma denner wi a gruffalo." "A gruffalo? Whit's a gruffalo then?" "A gruffalo? Whit, dae ye no ken? And muckle sherp teeth in his muckle strang jaws." "Whaur ar ye meetin him?" "By these stanes, the noo. And his favourite food is hot tod stew." "Hot tod stew! I'm no here" Tod yelped. See ye after, wee moose," and awa he skelped. 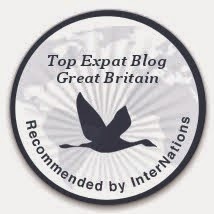 "See yon Tod! Is he daft or no? There's nae such thing as a gruffalo!"